Do you and your kids love being creative and exploring outdoors? These sessions promise to be lots of fun and give your kids a chance to let their imaginations run wild in the woods! Hosted by a range of extraordinary and enchanting characters, you will be invited to join him or her on a journey and be asked to help them out! These sessions encourage you to have fun with your children at your own pace. They also promise to be full of entertainment, adventure, drama, making, building, games and bush craft skills! Booking is essential and can be done by clicking on the green Book Here button in the top right hand corner of our website. If you have any queries, then please get in touch with Rachel at Growtheatre on 077 45 46 53 91. Returns and Cancellation Policy: Growtheatre CIC will reimburse tickets for our Family Events if this is requested 7 days in advance of the Family Event. If a refund is requested after that time period has elapsed, Growtheatre CIC will put your tickets on sale and if they resold before the day of the Family Event we will reimburse you the full cost of the tickets. Growtheatre CIC is unable to refund or change tickets on the day of the Family Event that the tickets are booked for. This is because we are unable to contact people on our Waiting List as we are usually in the woods preparing for the Family Event. In the unlikely event that not enough people book onto a Family Event, Growtheatre CIC reserves the right to cancel the Family Event with a minimum of 24 hours notice. All customers will be offered a choice of a full refund or to be moved to another Family Event. We were delighted to revive out Telling The Bees Performance Lecture at Kings Manor, York. Audience members took part in an interactive drama performance that looked at the past, present and future of bees and beekeeping. The Performance Lecture shared what a bee spoon is, told how the honey bee got her sting and offered a glimpse into the future. 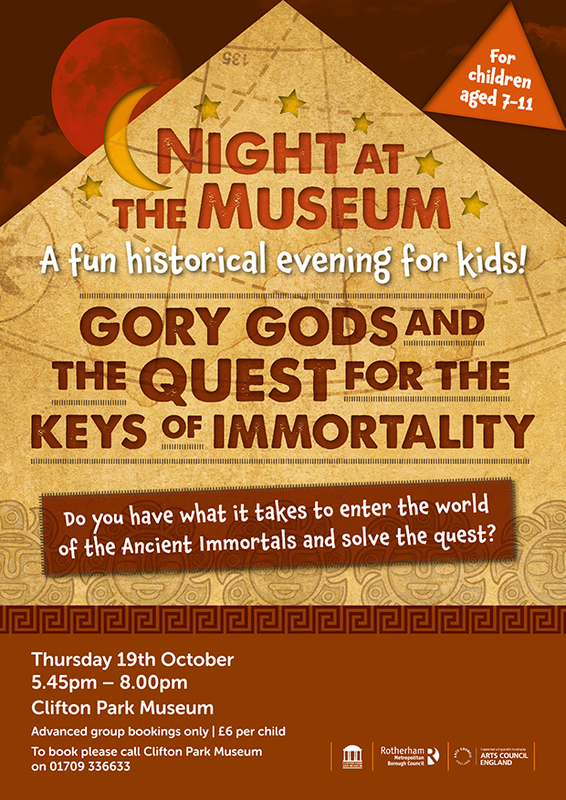 We were delighted to be asked to create this character-led, interactive evening for Clifton Park Museum. There is nothing like a bit of mummification, human sacrifice and immortal daring do – we hope the kids who come to visit the museum at night have a blast! Telling The Bees gave us the opportunity to collaborate on a creative project about bees with archaeologist Dr Toby Pillatt. It was a brilliant project that saw us working with with young people, academics, Sheffield Beekeepers’ Association, professional actors and students. We created a brilliant interactive Performance-Lecture in the beautiful Spiegal Tent for the Festival of the Mind. Supported by Heritage Lottery Fund, Waking The Ghosts of Wincobank Hill is part of larger project called Roots Of Iron, which is a project focuses on getting young people of Wincobank engaged in activities that explore the history, archaeology and heritage of Wincobank Hill. Waking The Ghosts of Wincobank Hill was an outdoor promenade performance as part of Light Up The Hill 2015. Local young people worked with Growtheatre’s director, a designer, a lighting designer and archaeology students. They created an outdoor performance as well as designing, building and making their own props, costumes and lighting effects. We were delighted to win the tender to design two Key Stage Two Stone Age sessions for Clifton Park Museum in Rotherham. We wanted to do something a little bit different to the museums normal schools’ sessions – so we suggested that we worked outside with a fire. The Museum was completely up for it and so the session was designed to be led in Clifton Park next to the museum. These photos are of our pilot session with the lovely Y5s of a local Primary School and include firelighting, bows and arrows, object handling, hunting mesolithic animals and building neolithic settlements. A summer holiday project with Sheffield Young Carers found us discovering Sheffield’s amazing Shire Brook Valley Nature Reserve – a hidden gem in Sheffield’s wonderful outdoor spaces. It was great to plan with staff from Sheffield Young Carers Project and come up with session plan for the day, which included games and using the environment to create mazes, learning to use tools and the opportunity to play creative games. Audio Adventure Trailer can be downloaded here. Available from July 2015: Download the The Mystery Of The Factory In The Woods Audio Adventure here to listen on a smart phone in Ecclesall woods or borrow an MP3 player from the J.G. Graves Woodland Centre (opening times only). Click here for full Audio Adventure details. Funded by the Heritage Lottery Fund, Sheffield’s Back Garden is a film by Growtheatre made with the education team at the Ecclesall Woods Woodland Discovery Centre. 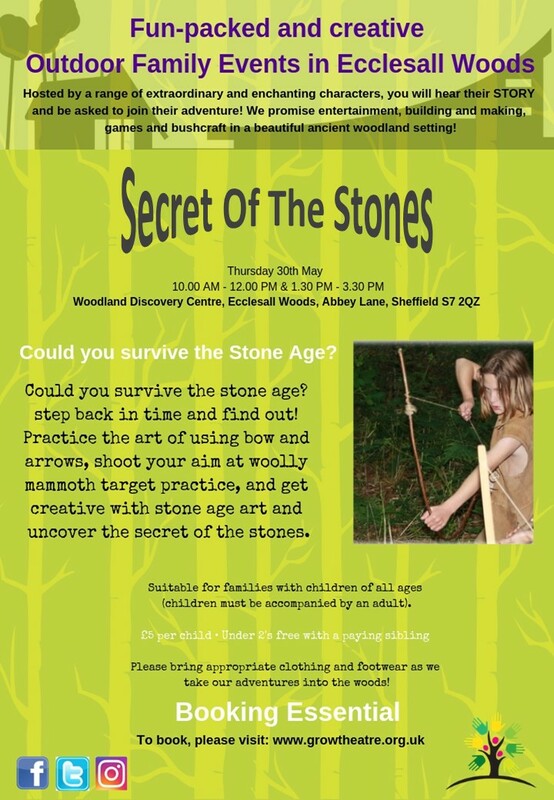 The film tells the story of Ecclesall Woods from Neolithic times to the modern day. Special thanks to Professor Mel Jones and all the people who took part! A community project that will bring together the residents of Stannington, local school children and people from across Sheffield who are passionate about growing their own food! Working at the Freeman Bio-Dynamic Garden at High Riggs, alongside Freeman College artisans and Growtheatre to explore a broad range of creative activities linked to the heritage of the site and crafting the land. Including learning how to make a copper garden trowel, tending to, harvesting and cooking seasonal produce and a whole host of creative activities that will allow everyone involved to understand the land beneath our feet and the impact it can have on our hands and heart. Come and join us at the Crafting The Land Public Open Day at the Freeman Bio-Dynamic Garden on 18 July to see what we have been getting up to! Photo by Jeremy Lampson. Crafting The Land, From Seed To Table is part of Ruskin in Sheffield, an initiative of the Guild of St George, funded by the Heritage Lottery Fund. Working with film maker Ellie Ragdale, young people from Wincobank and the Roots Of Iron Project a brief history of Wincobank Hill was created as an awesome animation film. It was projected onto Sheffield’s Bling Bus and shown on top of the hill as part of the Light Up The Hill Celebrations. We think that the young film makers did a fantastic job – here is the film! Light up the Hill from Ellie Ragdale on Vimeo. Theatre In The Woods are holiday projects for children. Working in Ecclesall Woods, children have a brilliant adventure with us and enjoy taking part in outdoor theatre making and developing ranger skills, such as working with wood, tools and ropes, to build and make props and sets! Music In The Woods are holiday sessions that offer families the chance to get creative and have fun together. We created songs, stories, musical instruments and stick characters. Parents and children, alike, had fun and loved working together.